Grassroots Garden coordinator Merry Bradley takes a shade break on a recent 90-degree afternoon, along with seasoned volunteer gardeners Diego Chaves, Levi Baker, and Lucy Baker. As the fourth of 12 children growing up on the outskirts of Omaha, Bradley had her own little garden as soon as she could walk. "My earliest remembrance is walking behind my dad's rototiller," she says, "and the soft earth beneath my feet." 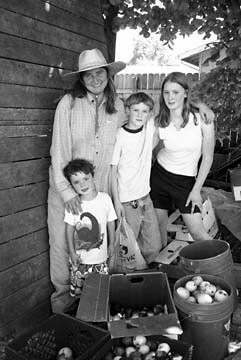 A 25-year resident of Eugene, Bradley went through the Master Gardener Program in 1999 and put in 800 hours at the Grassroots Garden that year. She was hired as the garden's only paid employee in 2000 and has since increased the its output tenfold. "What once was rock-hard clay is now fluffy rich loam," she notes. Last year, a total of 2600 people volunteered 16,000 hours and grew 40,000 pounds of produce for distribution by Food for Lane County . "We have a huge diversity of people," says Bradley. "Master gardeners are our teaching force. Beautiful things happen when people come together. There's a nice sense of connection and belonging."